"African literature has been preeminently a 'literature of liberation'. Until recently, African LGBTI writers did not join the conversation, not openly at least. Now the internet is changing that ... and LGBTI Africans who used to struggle in isolation are now interacting online, becoming aware of each others' lives and situations, working together for recognition and equality, and, increasingly, expressing their creative visions of the world in fiction and poetry. We hope this special issue of African LGBTI creative writing by rising generation of brave and talented young writers will point the way toward a future of proud, fearless LGBTI creative expression in Africa"
This special issue contained a beautiful collection of short stories and poetry, which portrayed the many different experiences of LGBTI Africans. Stories, such as "I Have Loved You" by Kevin Moremi about a complicated love triangle; Bree's "Identifying Myself", which explores gender roles and identity through dress; and "Kizori, My Brother" by Nkululeko Siboniso Mthembu about cross-dressing, were not only a joy to read, but showcased the complexity of LGBTI lives on the continent. The creative issue ends with a lovely piece on Abdellah Taia, whose work I showcased in an earlier post on LGBT fiction in Africa. 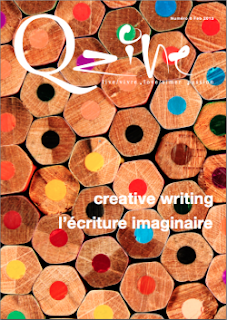 Interested in Q-zine's Special Creative Writing Issue? Read it here. Enjoy! !